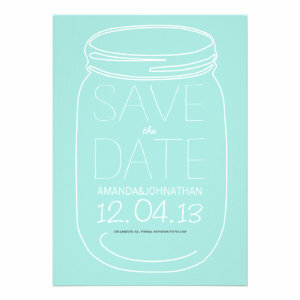 Here you can find many modern mason jar inspired wedding "save the date" cards your guests will love. 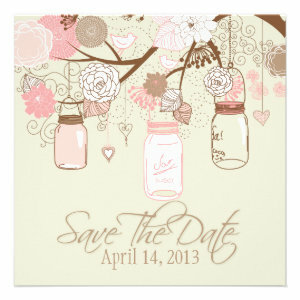 Call them chic, rustic or even elegant, Mason Jars are the next big hit in wedding decor. We have come up with five ways to make your next Mason Jar themed party a success! 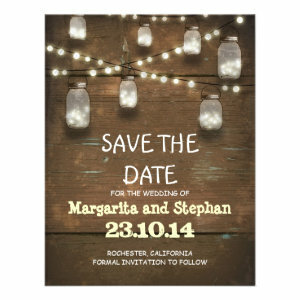 There are many unique ways to use Mason Jars for your next party or wedding reception. Our first tip is simple enough. Use Mason Jars as drinking glasses. Buy the ones with handles. You can get a dozen of them on Amazon for around $14. This is good for the whole family. 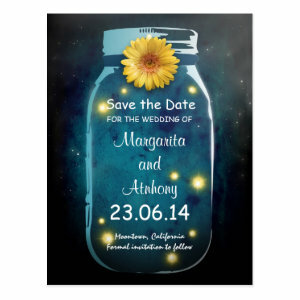 Place pictures inside your Mason Jars. 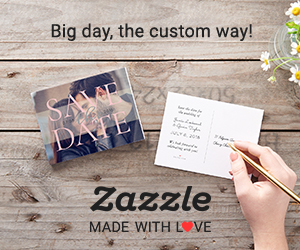 Choose from a wide range of photos, including childhood, with family and friends and photos from the engagement. The jars will give an elegant look sitting as the centerpiece of your reception tables. Thirdly, Mason Jars make great vases! They are perfect for flowers. 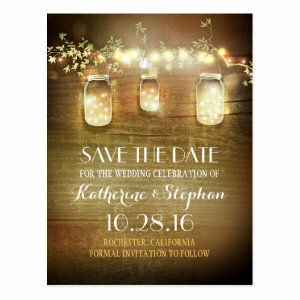 Hang them above your reception tables or sitting pretty on your tables as centerpieces. 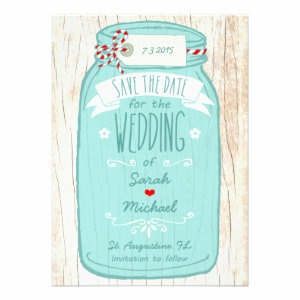 Number four involves cutting out or having number cards made to tie around big Mason Jars. Decorate these jars accordingly and place on the table. This will let your guests know which table is theirs. 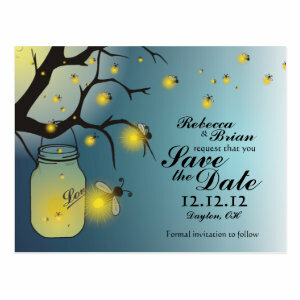 Lastly, You can also use Mason Jars as candle holders on your tables and as lanterns to hang from trees and hooks. 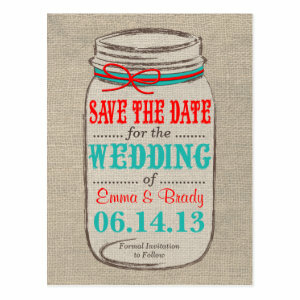 One more great idea is having themed Mason Jar Save The Date wedding invitations. This will tie your wedding theme together, leaving your guests full of awe and wonder for days. 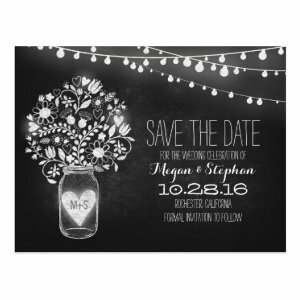 There are several choices of Save The Date, Mason Jar announcements that can be easily personalized, captions and photos can also be added for free.